AN innovative fundraising campaign has been launched by Botanic Inns door staff in aid of the Shimna Valley Holiday Home in Newcastle run by the Northern Ireland Cancer Fund for Children. Door staff at the Botanic Inn’s 16 bar outlets comprising some of Belfast’s most popular bars will be embracing customers with hugs this weekend as part of a campaign to raise money for this important cause. 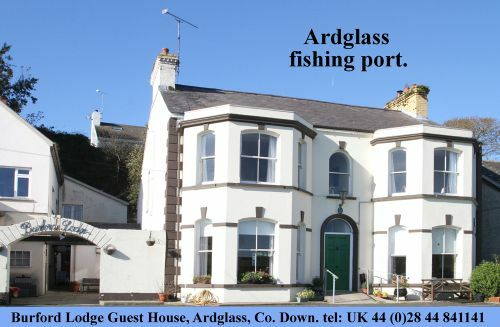 The Botanic Inns also owns Denvir’s Hotel in Downpatrick. From 1-9 December, all Botanic Inns door staff will offer customers a hug in return for a donation to the charity. The idea is the brainchild of Paul McDonald from Apartment door staff and has been launched with the support of TV favourite Sarah Travers, a keen supporter of the charity. BBC presenter Sarah Travers and Apartment doorman Paul Mcdonald launch the ‘Hugs not Thugs’ initiative to raise money for Northern Ireland Cancer Fund For Children. 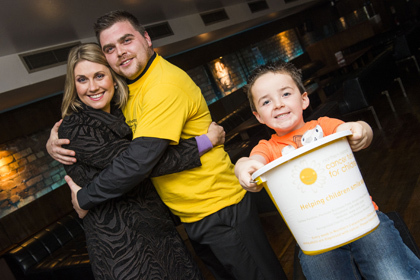 The charity drive will see door staff offer customers a hug in return for a donation to the NICFC. It runs from 1-9 December across all 16 Botanic Inns venues. Joining the launch five year old Jake Stanex who has suffered from cancer. Customers who’d like a hug from the friendly door staff simply need to make a small donation at the collection points, situated at the entrance to each Botanic Inns venue. Paul McDonald from Apartment security and BBC presenter Sarah Travers were joined at the launch of the charity initiative by five year-old Jake Stanex, who was just two years old when he was diagnosed with Leukaemia. The Dundonald lad has just completed over two and a half years of treatment and is doing well. Jake’s mother Karen urged people to ‘embrace’ the Hugs not Thugs campaign and dig deep this festive season to support a fantastic cause close to her heart. Karen added: “As a family we had never been on holiday as it was too much of a risk to take Jake on a plane or a boat. So visiting the NICFC’s Pine and Birch respite cottages gave us a chance to spend time as a family in a safe environment with highly-trained staff who were sensitive to what we were going through. Paul McDonald from Apartment added: “Doormen get a lot of flak in this city but underneath it all we are just big softies. Northern Ireland Cancer Fund for Children is an incredibly hard-working charity which offers practical, emotional and financial support to local kids with cancer and their families. Botanic Inns hopes to raise a significant amount of money with the Hugs not Thugs campaign and is encouraging as many customers to get involved and help raise funds for a fantastic charity.